Congratulations on completing the competition on a high, and it’s sad that I found out your blog only after the challenge is over! Lol! Thanks, I’m glad you enjoyed it. I think I’ll be tweaking things a bit in edits for sure, so I can better plan a follow on story. Well I guess that IS a two-slices-of-pie kind of night. Total thumbs up on this twisty twisted tale – I savored every post. And yes, yes, yes to more! Thank you! 😀 I’m hoping to edit this one (quite a lot, probably), and then a follow up story will be coming. Well done, Natalie. Tasty finish, and I mean more than the key lime and apple pie. I’m giving you a virtual High-Five across the Internet. Pat yourself on the back, you did an awesome job with this story. Kept it high action, and kept the reader begging for the next segment — everything you want in a crime thriller. I must confess that I didn’t read the whole story, only fragments. I know it is a crazy way to follow a story… But all the #AtoZChallenge is a bit crazy, isn’t it? I can’t believe you linked all the letters into such a imaginative and alluring story. I read every word. Would make a good book. Great story. I think I like Johnny the best. Congrats on finishing the challenge. What will you do with the story now? Are you thinking of making it into a novel? It was really good. Just dropping by to check in and say hello. Give your blog a poke, as they say. 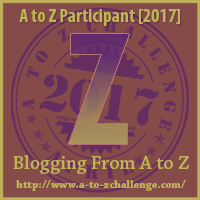 Here’s a belated congratulations to your finishing the A to Z Challenge. Hope life is finding you well as we head toward the winter months. Thanks for being a participant in the 2017 Challenge. Just stopping by to wish you a happy 2018! Hi! Happy New Year to you too 🙂 I can’t believe it’s 2018 already.